Dr. Garcia started his scientific career at his home country Venezuela, where he obtained a Masters degree in Physics, working on the calculation of atomic data required for astrophysics. He later completed his PhD degree in Physics at the Catholic University of America in Washington DC in 2010. In his dissertation project, which was carried out at the NASA Goddard Space Flight Center, Dr. Garcia laid down the foundations of a computational code to model the X-ray radiation that is produced in the regions very close to black holes. He continued producing and implementing these models to study different astrophysical sources, such as black holes in binary systems with masses similar to that of the Sun; as well as supermassive black holes with masses of million to billion times larger, observed at the center of many active galaxies. Dr. Garcia is now a Postdoctoral Scholar at the California Institute of Technology in Pasadena, working as a Science Team Member of NASA’s X-ray mission NuSTAR. He is also a visiting Research Associate at the Harvard-Smithsonian Center for Astrophysics, and now a Senior Research Fellow of the Alexander von Humboldt Foundation. During my first year in the Physics career I had the opportunity to witness a total Solar eclipse that I could luckily observe in my hometown. This event drew me into astronomy. Shortly after I read a great book called A Brief History of Time by Stephen Hawking, and much later I read Black Holes and Time Warps, by Kip Thorne. These two books showed me how incredibly interesting black holes are. Since then, I looked for the opportunity to study anything I could regarding these objects, which in my case came by studying the properties of the X-ray emissions in extreme astrophysical environments. For the last few years I have established a strong and fruitful collaboration with the team led by Prof. Joern Wilms at the Dr. Karl Remeis-Sternwarte in Bamberg. The theoretical models that are needed to explain the observed data for black holes and similar sources are complicated enough so that they cannot feasibly be done by a single person or group. With my collaborators in the US, I produce advanced models for the synthetic spectra including detailed atomic physics, while the relativistic effects caused by the strong gravity of black holes are modeled with the codes produced by Dr. Thomas Dauser and Prof. Wilms at Bamberg. The combination of these two approaches has resulted in a perfect synergy, which allow us to advance significantly faster in our research. FAU is very well known in the X-ray community; in particular thanks to the important role that Prof. Wilms has played over the years, but also for the contribution that many of its excellent students and postdocs make continuously through scientific papers and conference talks and posters. In addition, the Remeis Observatory is closely involved in the development of the European X-ray missions Athena and eRosita, which are two of the most exciting X-ray observatories currently being planned. This is certainly one of the most positives aspects of being here. The interaction with all the members of the Observatory has been more than pleasant. This includes faculty, postdocs and students alike. In the short time I have spent here, we have already started the discussion of several different research projects beyond what was originally planned. Near black holes that accrete matter – like those in binary systems, or in the center of many galaxies) – the conditions are very extreme and thus large quantities of high-energy radiation are produced. Most of this radiation can be observed in the X-ray band. I focus on modeling the interaction of these X-rays with the gas near the black hole, and how this radiation will be affected after the interaction. One could think of this as taking a “radiography” of the innermost regions of a black hole. Combining the models with the observations, we can obtain information about the black hole, for example whether it is spinning or not and how fast as well as information regarding the gas nearby, such as its composition, temperature, and dynamics. My main role is to produce and improve what it is known as the “X-ray reflection models”, which is a large library of synthetic spectra that predicts the reflection of X-rays off an accretion disk around the black hole under very different conditions. These spectra contain large quantities of atomic lines and other features, which are then compared with what it is observed from black holes at high energies. Currently, I am also leading a program to compute new atomic data to expand our database, and also to apply these models to a large set of archival data from different X-ray observatories. The collaboration with FAU, in particular with the members of the Observatory in Bamberg, has resulted in the most advanced model currently available to study the high energy emission from astrophysical black holes. Our model has quickly become the state-of-the-art in the X-ray community, and it has been used to study more than 80 black hole systems, including both stellar-mass and supermassive. These studies have revealed that in most of these sources the black hole is rotating very fast, close to the maximum value allowed by General Relativity. In these cases, the X-ray emission is observed to be largely perturbed as a consequence of the bending of the photons` paths when they travel in a curved time-space. The detection of these phenomena constitutes an indirect proof of theory of General Relativity. We have also recently found strong indications of very large amounts of heavy elements like iron in the gas near the black hole, which is several factors larger than what is typically expected, and its explanation is still under investigation. This is always a difficult question to answer, because the benefits of fundamental science like physics and astronomy are almost never seen directly, but through their indirect contribution to the common scientific knowledge. However, black holes are probably one of the most exotic objects in the Universe, and thus their study should always be at a high priority. They are also one of the greatest laboratories we can think of: the conditions near a black hole’s event horizon are impossible to re-create in any laboratory on Earth, so they give us the opportunity to study the behavior of matter in the strong gravity limit. This includes the possibility of testing current theories, such as General Relativity; and to a certain degree, Quantum Mechanics. Bamberg is one of the nicest places I have been so far. It is a beautiful town in terms of its architecture and landscape. It is also very peaceful, yet there are many interesting places to eat or go out. I also enjoy the fact that I can easily take the train and reach other equally nice but bigger cities such as Erlangen and Nuremberg. During the first week of my visit I had the opportunity to attend the dissertation defense of a colleague of mine, Dr. Natalie Hell. I found the whole experience quite enjoyable, in particular how much work the other students put into organizing the event and the celebration afterwards. I have heard about the tradition of a custom-made graduation hat, but it was great to see it in person. Also, driving Prof. Wilms’ Mercedes-Benz on the Autobahn will be hard to forget. I found the area around Dr Karl Remeis-Sternwarte quite special. It has a great view of the town, and I particularly enjoy running next to the river with the Remeis Running group. In the town, Café Esspress has become my favorite place for breakfast on the weekends. 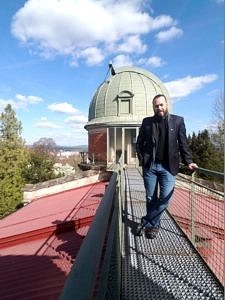 I couldn’t finish this interview without expressing my gratitude to all the staff at FAU and at the Observatory in Bamberg. I felt extremely welcomed since I arrived and everyone has been very helpful in ensuring that I can get everything I need. I must especially thank the students for all their attentions and considerations during my time here. Thank you for the interview, Dr. Garcia.